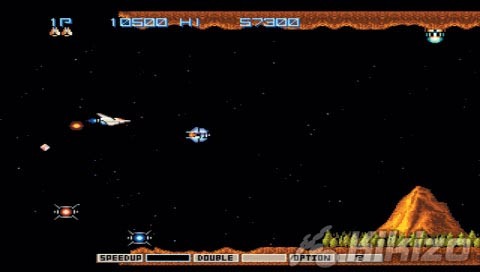 While memorization has always been an important part of the Gradius series, there are various points in the games where pure twitch gaming skills will be tested as players try to avoid crashing into the terrain while being inundated with a constant barrage of enemy ships and deadly objects while working their way to the challenging boss encounters that await them at the end of each level. The end level boss battles have always been one of the highlights of the Gradius series. While mainly pattern-based affairs, each boss encounter presents players with different types of challenges they'll need to overcome, with particular highlights of these encounters being the battles against familiar bosses from Salamander/Life Force as well as the infamous 'Boss on parade' which has players battling through a series of bosses, one right after another, eventually leading to a final confrontation deep within the Bacterion home world. Thankfully with the constant dodging and shooting players will indulge themselves in throughout the cosmic worlds of the Gradius series, the games all control really well, at least once you've used the speed-up power-up enough times to get your ship up to at least a moderately fast and maneuverable speed. The games all share the same simple and easily configurable control scheme which consists of a shoot and missile button, with corresponding rapid-fire buttons also available for both. In addition players have the option of activating their power-ups manually or letting the CPU automatically activate them for them by selecting the semi-automatic option. While the games feature standard d-pad controls, fortunately Konami has seen fit to include support for the analog nub as well, allowing for much smoother ship movements. As expected, the PSP d-pad doesn't lend itself well with fast, precision-based games like this as the more intense areas of the games tend to become an exercise in frustration while trying to weave in and out of fields of enemy fire only to crash into the terrain or energy beams because the ship's 8-way movement wasn't as smooth as can be with the d-pad. And while Capcom's d-pad cover made using the PSP d-pad a lot less painful, it still had its limitations. As a shoot-em up collection Gradius Portable is simply awesome, especially since all of the included games stack up well on their own. While the original Gradius understandably sports graphics and sounds that are quite dated compared to later games in the series, and gameplay that's a little limited by repetitive boss battles and only a single default power-up type, still, the game is good solid fun throughout its 7 levels. 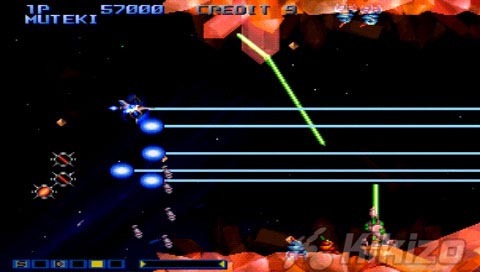 Moving onto the sequel, Gradius II: Gofer no Yabou, which was never officially released in the U.S.. Gradius II brought enhanced graphics and sounds to the table, as well as began the evolutionary process of the series' power-up system by presenting players with the option to select different types of power-ups at the start of the game. 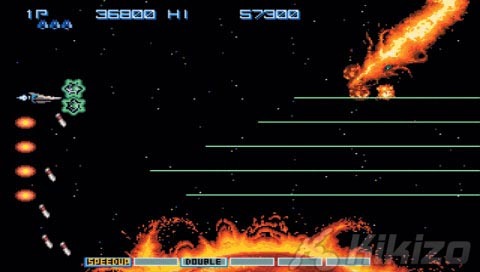 In addition to featuring 8 levels, longer in length than the original with more varied bosses, Gradius II also introduced the aforementioned 'Boss on Parade' series of boss battles. With Gradius III things became a little more interesting and a whole lot harder. The arcade version of Gradius III is notorious within the Gradius community as being the most frustrating game in the series. In comparison, the PS2-exclusive Gradius V would be considered a cakewalk by some. There are 10 levels to clear in Gradius III, and more than likely, only the most devoted of Gradius fans and ace shoot 'em up vets will have seen the game to the very end, and even then they'll have exhausted all obscenities during the process. In addition to being a bit cheap at times with no option to Continue after losing all of your lives, one of the more annoying problems that plagues the Gradius 3 arcade game is how the game's check point system is structured when compared to the other games in the series. At times the game seems to take no prisoners, as was the case when battling through the series of bosses during the Boss on Parade portion of the game, only to lose to the final boss encounter during that portion of the game and have to restart the entire process all over again. Or even better, how about completing the Boss on parade portion, proceeding into the underground moonbase, accidentally crashing into a wall and getting thrown right back to the very beginning of Boss on Parade again. Fun! Just make sure your PSP wrist strap is on tight because you'll be tempted to throw the unit at some point during the game. Fortunately even Konami knew the deal and re-designed the SNES version of Gradius III with better graphics, sounds, and more importantly, a lot more balanced gameplay. 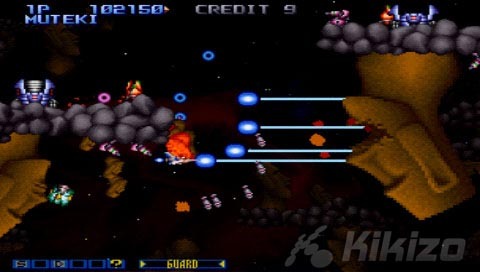 In addition, the new, customizable power-up system that was first introduced in the Gradius III arcade game made its way over to the SNES version mostly intact, allowing players to put together some cool weapon arrays, thus making the SNES version of Gradius III one of the best games in the series and one of the most enjoyable shooters on the market. Unfortunately, Konami didn't bother including the SNES version in Gradius Portable, saddling players with the notorious arcade version. 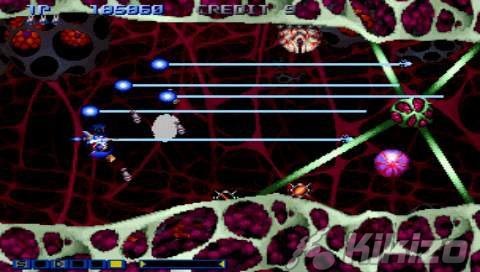 With the advances made in Gradius III and Gradius Gaiden, Gradius IV: Fukkatsu, which was released in 1998, a year after Gaiden, was actually a step back in the gameplay and design department. The game featured 9 levels, many of which looked pretty similar to stuff we'd already seen in previous Gradius installments, with only a few small variations added here and there and a slightly new coat of paint slapped onto the levels. One of the other disappointments was that the wonderful weapon edit mode in Gradius III was nowhere to be found and we were right back to a power-up system similar to that of Gradius II. With all that said, Gradius IV isn't a bad game by any means, but unfortunately, it's the one game in the series where you can't help but feel as if Konami either got lazy or just ran out of ideas as the game didn't really bring anything new to the proverbial table. Saving the best for last, we finally come to Gradius Gaiden, the highlight of the entire package. Originally released as a PlayStation-exclusive title, Gradius Gaiden is easily one of the most interesting entries in the series. The story takes place 200 years after the 3rd Bacterion war ended and the Bacterions were finally defeated at the end of Gradius 3. During that time, the civilization of Gradius enjoyed a period of peace and prosperity, but as to be expected, it didn't last as some unknown force emerged from the mysterious Dark Nebula, a region in space also known as The Evil Range. Attacking and ruining the colony of planets of Gradius, the mysterious invaders were merciless in their assault and managed to overpower and wipe out 99% of the Gradius army. Desperate and with very little options left, Gradius army headquarters launched a counter-offensive by sending four hyper-space fighters into the center of the Dark Nebula, the main source of the mysterious alien invaders. Gradius Gaiden is one of the more unique entries in the Gradius series. The PlayStation version featured a 2-player co-op mode, which was a first for the series, and is sadly missing in Gradius Portable as there are no Wi-Fi features in Gradius Portable whatsoever. In addition, the game made good use of the PSX hardware to display some nice visuals will cool special effects, and solid sound design. The gameplay is definitely Gradius with a total of 9 stages containing old and new levels, enemies, and a revamped power-up system.